Mrinalini Dixit received her bachelor’s degree in biology. She received her master’s degree in fish and marine biology in 1974 from Gorakhpur University, India. She also got her Ph.D. in 1980 in endocrinology from Gorakhpur University, which is now renamed as Deen Dayal Upadhya University. 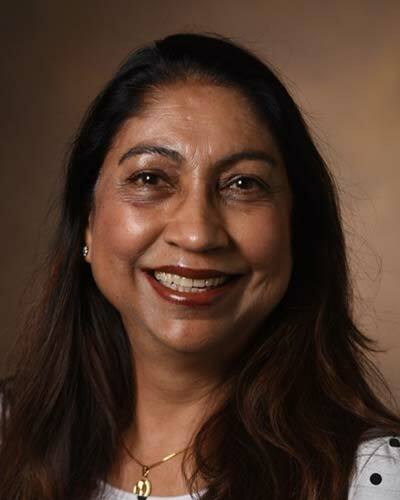 She moved to the United States in 1981 and joined a research position in cancer biology at Meharry Medical Center. She gained her molecular biology post-doctoral trainings under several successful and productive mentors in cancer biology labs. She worked in Molecular Physiology and Biophysics from 2001-2014 as a research associate and staff scientist and gained vast experiences in proteomics and the protein structure field. She always had a great interest in neuroscience and wanted to use her cellular and molecular expertise to solve the mysteries of the brain, and she finally received that opportunity by joining Dr. Laura Dugan’s lab in 2014 as a staff scientist. Since then, she has been diligently working to learn about the role of p22phox in brain inflammation. Additionally, she has converted human inducible pluripotent stem cells into mature neurons with fully functional NMDA receptors.